The task which we were asked to perform gave us two options. We had to find one successful portrait and one unsuccessful and explain why. This image is very unsuccessful due to the fact the photograph is very staged. The person in the photograph is obviously showing off ‘fake’ cuts and bruises on her face and could have been taken for something such as a fancy dress shop and for selling this kind of false make up. You can tell it is fake due to the rest of her face looking completely perfect as well as her hair and also her expression is also not so believing. I would say this kind of photography has been set up and is not telling the truth about the person involved, and is therefore unsuccessful at giving a realistic story. After looking into this, I found I had found the photograph on a ‘Make-Up Artists’ Website. 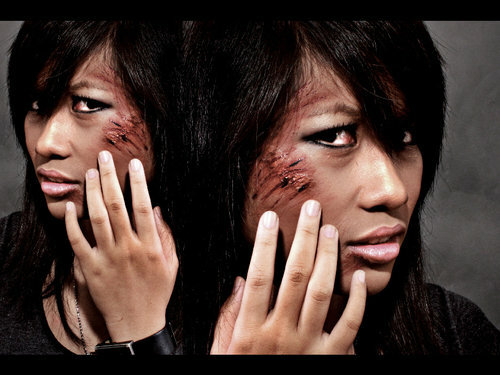 Her name is Maru Ventura and she specialises in different styles of make-up, whether this being domestic abuse (like the photograph above), casual make-up, artistic or for special events. This again proves that this has been set up and the person in the photograph is most likely a model and is being tested on to show off what Ventura is able to create. 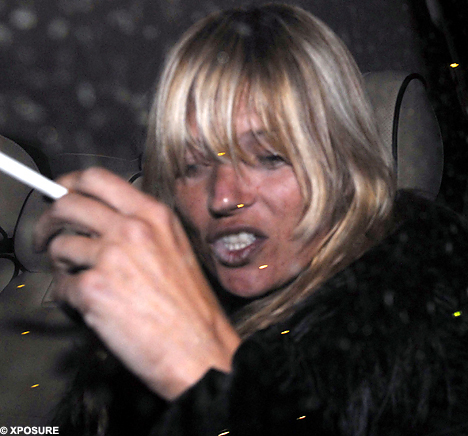 This photograph of Kate Moss is a very successful photograph of what represents her. Although many see her as a beautiful model and the photographs/campaigns she has taken part in have showed her off excellently. There is also her true background, which in this case, is her drug use. A lot of people have heard about her scandal and this picture captures it perfectly. This is a more true representation than her airbrushed model shoots even though they do show some successful parts due to that is her real career, but I do believe this photograph is a better representation to showing what her actual personality and lifestyle consists of beyond her career. I found this photograph on different blogs of which had many stories and opinions to express about Kate. Obviously the photograph was taken after some sort of party or on a night out. This therefore shows that it has been captured without Kate obviously planning for it to happen but paparazzi are always there to capture photographs for the public to discuss. The photo definitely isn’t set up like her photoshoots and was taken at heat of the moment so it therefore portrays a true portrait of Kate.